Author: Off, Carol Set In . . . Description: Three Canadians – Lewis MacKenzie, Romeo Dallaire and Louise Arbour – were at the centre of the two greatest tragedies of the 1990s. Two of them could have stopped the killing. One was asked to bring the perpetrators to justice. In this riveting, original and explosive book, Carol Off explores the failure of peacekeeping missions in Sarajevo and Rwanda, and the international community’s attempt to redeem itself by prosecuting the people responsible for the genocides. Events turned on the action of two Canadian generals: the fox of the title, Lewis MacKenzie, who commanded the UN forces in Bosnia for the first crucial months of the conflict; and the lion, Romeo Dallaire, who developed an interventionary plan that he believed would have prevented the Rwandan genocide but was forced by the UN to stand by while 800,000 people were slaughtered. 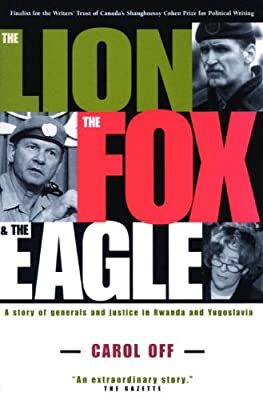 The eagle is Louise Arbour, a Canadian judge who became Chief Prosecutor for War Crimes in Rwanda and the former Yugoslavia.